Welcome to the official website of the Office of the University Registrar of the University of the Philippines Cebu. Who is your College Secretary? Where to find your SRE – Student Records Evaluator? A graduating student with an academic record better than average may be permitted to carry a heavier load in the last year of his course. A maximum of 6 units overload is allowed which may be taken in the first and/or second semester. Application for overload exceeding 6 units may be allowed, only in meritorious cases. Secure and fill out the Application for Student Overload Form, in three copies. Get endorsement from your Adviser and Department Chair/ Program Coordinator. Get approval from your College Secretary. If approved, attach approved form to your Form 5 or Change Matriculation request. Art. 340. No undergraduate student shall be allowed to take more than 18 non-laboratory units or 21 units including laboratory work; Provided, however, That a graduating student with an academic record better than average may be permitted to carry a heavier load in the last year of his course; Provided, further, That this rule shall not affect or alter any existing course duly approved by the University Council and the Board of Regents in which the normal semestral load is more than 18 units. Art. 341. In the summer term, the normal load shall be six units, but in justifiable cases, the Director of the Summer Institute may allow a student to take nine units. Secure and fill out FORM 26 Dropping Form (green form), in four copies. See your Instructor for action on your request. Pay fee at the Cash Office. Submit Dropping Form and Official Receipt to the Office of the College Secretary. Receive student’s copy and instructor’s copy of the green form. Secure and fill out the Change of Matriculation Form (pink form), in four copies. Get endorsement from your adviser and instructor/s. Present pink form with attached Registered Form 5 to the Office of the College Secretary for processing of enlistment or cancellation, and assessment. If beyond the deadline, submit a letter request addressed to the VCAA, attached to the pink form, endorsed by Adviser, Department Chair/Program Coordinator, College Secretary, and University Registrar. If a scholar, present pink form to the OSA for updating. If there is a fee, pay fee at the Cash Office. Submit Change of Matriculation Form and Official Receipt to the Office of the College Secretary. Receive student’s copy of the pink form with “Registered” stamp. At the end of every semester, students are required to check their grades and scholastic status to determine if they are eligible to enroll in the following semester. must first qualify for readmission before they are allowed to register during the succeeding semester. Secure and fill out the Appeal for Readmission Form, in one copy. Write a Letter of Appeal, addressed to the Dean of your College, stating the compelling reason(s) for your status. Please also indicate what steps have been or will be undertaken in order to ensure good academic standing. Secure True Copy of Grades (TCG) from the OUR. Prepare a Plan of Study detailing the courses to be taken from the time of readmission until graduation. Ask your Adviser to approve your Plan of Study. Get endorsement of your appeal from your Adviser. Get endorsement from your Department Chair or Program Coordinator. Get endorsement from your College Secretary. For Category A or B, get endorsement from your College Dean. For Category C only, get the approval of your College Dean. This is the last step if you are only asking for an extension of residence (waiver of MRR). Wait for the action of the Admissions Committee. Receive Notice of Action of the Admissions Committee, from the Office of the Vice Chancellor for Academic Affairs. Probation. – Any student who, at the end of the semester obtains final grades below “3” in 50 per cent to 75 per cent of the total number of academic units in which he has final grades shall be placed on probation for the succeeding semester and his load shall be limited to the extent to be determined by the Dean. Probation may be removed by passing with grades of “3” or better in more than 50 per cent of the units in which he has final grades in the succeeding semester. Dismissal. – Any student who, at the end of the semester obtains final grades below “3” in at least 76 per cent of the total number of academic units in which he receives final grades shall be dropped from the rolls of his college or school. Art. 390. Any student on probation in accordance with the preceding article who again fails in 50 per cent or more of the total number of units in which he receives final grades shall be dropped from the rolls of his college or school subject to the provisions of the following article. Art. 391. Any student dropped from one college or school shall not ordinarily be admitted to another unit of the University unless in the opinion of the Dean of Students his natural aptitude and interest may qualify him in another field of study; in which case he may be allowed to enroll in the proper college, school, or department. Art. 392. Permanent disqualification. – (1) Any student who at the end of the semester or term, obtains final grades below “3” in 100 per cent of the academic units in which he is given final grades shall be permanently barred from re-admission to any college or school of the University. Any student who has dropped in accordance with Article 389 on Dismissal, or Article 390 and again fails so that it becomes necessary again to drop him, shall not be eligible for re-admission to any college or school of the University. Art. 397. No readmission of dismissed or disqualified students shall be considered by the Deans without the favorable recommendation of the University Guidance Counselor. Cases in which the action of the Deans conflicts with the recommendation of the University Guidance Counselor may be elevated to the Vice Chancellor for Academic Affairs. His decision shall be final. Note: In case a Waiver of MRR is granted, each extension shall be for a period not exceeding one semester at a time. *1. The College, through the Dean or his duly authorized representatives, shall notify the parents/guardian of every student granted leave of absence and the Registrar, of such leave, indicating the reason for the same and the amount of money refunded to the student. 2. For leave of absence to be availed of during the second half of the semester, faculty members concerned shall be required to indicate the class standing of the student (passing or failing) at the time of the application for the leave. No application for leave of absence shall be approved without the class standing being indicated by the instructors concerned. This should not be entered in the official Report of Grades. 3. No leave of absence shall be granted during the semester within two weeks before the last day of classes. If the inability of the student to continue his classes are for reasons of health or similar justifiable causes, his absence during this period shall be considered excused. Grace Period: A student is given one academic year to remove the INC or 4.0. Secure and fill out the Application for Waiver of Prerequisites, in three copies. Get endorsement from your Adviser, Teacher in Prerequisite Course, Teacher in Course to be Enrolled, OSA, and Department Chair/ Program Coordinator. Submit application form to the Office of the College Secretary for action. If request is approved, you may proceed with registration for the specified course. Courses approved by the University Council as prerequisites to others may not be waived. However, in meritorious cases, students who have previously enrolled and fully attended a course that is a prerequisite to another may be allowed to enroll in and attend the latter course for credit, without having passed or earned credit for the prerequisite course. Permission shall be granted only upon application by the student. The application shall be accompanied with certifications from a) the student’s instructor in the prerequisite course that the student had fully attended the said course; and b) the Vice-Chancellor for Student Affairs that the student’s failure to pass or earn credit in the prerequisite course was not due to disciplinary action imposed upon him/her. Each college shall be authorized to grant the permission, and shall act through a Dean’s committee, which shall determine the merit of the application. The said committee shall include the College Secretary. The student who is granted permission under these rules is required to enroll in the prerequisite course simultaneously with the course to which the former is a prerequisite, or immediately in the next semester. 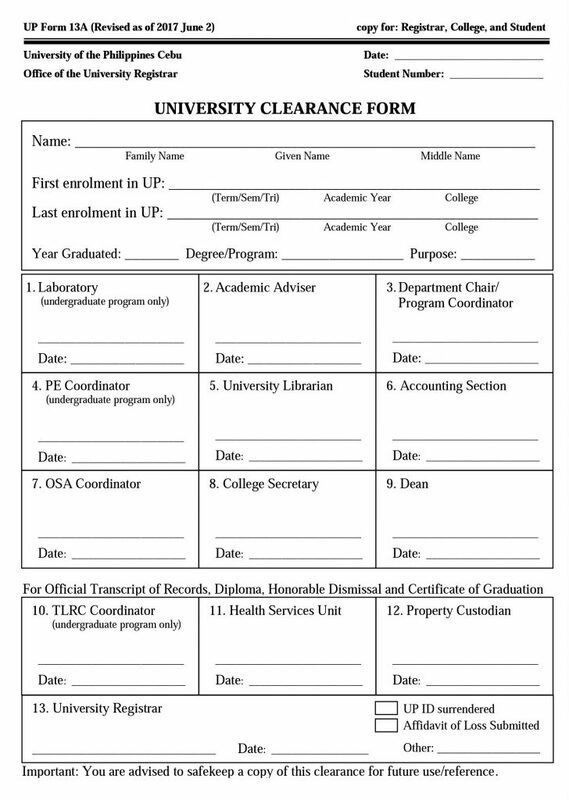 Secure and fill out the University Clearance, in three copies. Secure signatures as required, in order. Submit the duly signed (until #12) university clearance to the OUR and surrender your ID or an affidavit of loss for lost ID, for action of the University Registrar. Receive copy of your University Clearance duly signed by the University Registrar.